closely related to the extant Phaeocryptopus, which infects the leaves of a number of extant conifers, thus suggesting specific parasitic relationships with certain conifers since the Late Cretaceous. Trichopeltinites is a microthyriaceous (Dothideales) fungus that can be traced back to the latest Cretaceous (Maastrichtian). Specimens from rocks of the Cretaceous-Paleogene boundary in Alberta, Canada, suggest that this fungus can be correlated with the accumulation of organic matter (coal) under wet conditions, rather than with a particular paleolatitude (Sweet and Kalgutkar, 1989). Two interesting ascomycetes were found within the permin-eralized leaf of an extinct palm from the Eocene Princeton chert (Currah et al., 1998). Palaeoserenomyces allenbyen-sis is compared to modern Serenomyces, which forms leaf spots (so-called tar spots) on palms. 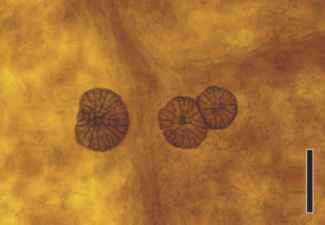 Within the locules of the stromata of Palaeoserenomyces are globose ascomata of a mycoparasite, Cryptodidymosphaerites princetone-nsis. This mycoparasite appears similar to the extant form, Didymosphaeria, which today is a mycoparasite on asco-mycetes that form stromata (a type of pseudoparenchyma-tous fruiting body). The Vizellaceae (Dothideales) is a small family of epiphyl-lous ascomycetous fungi that can be traced into the Eocene. 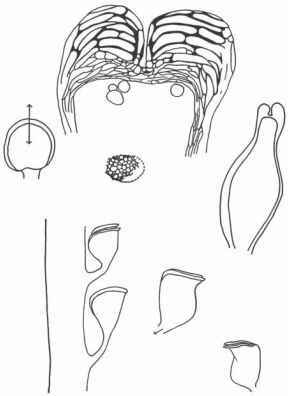 It is one of only a few families of fungi that can be identified in the fossil record solely on the basis of non-reproductive (vegetative) features, as it has distinctive septate hyphae with regularly alternating dark and hyaline segments (Phipps, 2007). One of the most comprehensive studies of fossil epi-phyllous fungi is the contribution by Dilcher (1965), who described a large number of fungi found in association with middle Eocene angiosperm leaves, including several members of the Vizellaceae. In several instances it was possible to reconstruct the entire life history of the fungus, including both the sexual (telemorphic) and asexual (anamorphic) phases, thereby making assignment to modern groups even more reliable. One of the more common forms in this biota is Vizella memorabilis, which is characterized by hyphae with alternating short and long cells (Selkirk, 1972). In the Eocene clay pit (Claiborne Formation) where this fungus was collected, it is most commonly found on the upper surface of angiosperm leaves of the genus Sapindus. During the growth of the fungus the hyphae dichotomize to form colonies that may be up to 450 pm in diameter. Irregular proliferations of cells form a short, lateral branch that produces two types of fruiting bodies. The larger fruiting bodies (asco-carps) produce two-celled spores, whereas the smaller ones (pycnidia) produce single-celled spores. Up to 60 ascospores are produced in each ascocarp, which are 10 X 14 pm. 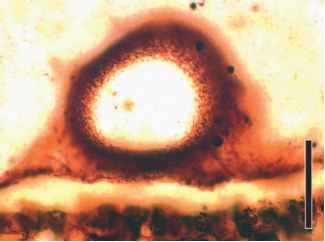 Pycnidiospores are oval, unicellular, and oriented in chains. Upon germination, the pycnidiospores form small germinal tubes that penetrate the leaf epidermis. Fossil fungi of this general type, but which lack spores, are often assigned to the genus Entopeltacites (FIG. 3.108) (Phipps, 2007). Epiphyllous fungi of the Vizella type are morphologically identical with the modern genus Manginula, a form that was included within the Microthyriales. In addition to determining stages in the life history of several of these Eocene epi-phyllous fungi, Dilcher was able to document various levels of host specificity. 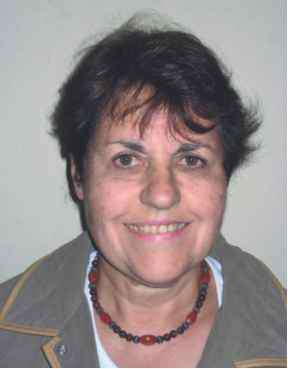 For example, V. memorabilis was found on a number of different types of leaves, whereas others, such as Meliola anfracta, appeared consistently only on certain leaf genera. In other instances, fungi appeared to be specific for only one surface of the leaf. Determining host specificity for particular types of fossil fungi is a difficult and long-term endeavor that will require careful documentation of both the fungus and host plant from many localities and stratigraphic levels (Venkatachala and Kar, 1968). Nevertheless, it represents an important line of research that can provide new data on the evolution and variety of fungal interactions in the fossil record. in their geographic distribution, however, appears to be precipitation, not temperature, and these fungi can be correlated with regions where mean annual precipitation reaches >100 cm/yr (Elsik, 1978). On the basis of leaf types present at the Tennessee site, it has been suggested that the region was subtropical during the middle Eocene. A comparison of the fossil fungi with the ranges of comparable modern forms (the Nearest Living Relative method applied to fungi) supports the theory that this area was a low-lying, coastal region characterized by a moist, subtropical climate. It may be possible in other fossil floras to utilize various forms of fungi to provide more accurate information on paleoclimatic regimes (Lange, 1978), especially in those instances where modern fungi can be used as analogs for microhabitat determination. Another fungus that has been used to infer paleoclimatic information is Meliolinites dilcheri (Daghlian, 1978a). This form, from the early Eocene of Texas (Rockdale Formation), consists of colonies <2mm in diameter (FIG. 3.109). The hyphae (FIG. 3.109) produced numerous short, lateral, two-celled branches consisting of a short stalk and a capitate head. 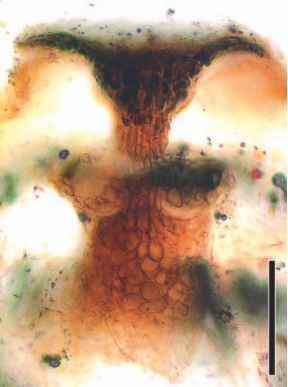 The fossil fungus is included within the Meliolaceae, the modern members of which are parasitic and common in warm, humid, forested tropical areas today. Phragmothyrites (FIGS. 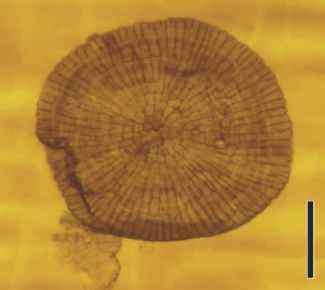 3.110, 3.111) is another fossil epiphyllous fungus; it consists of ascomata with radiating, pseudoparenchymatous hyphae (Phipps and Rember, 2004). fungi did not arise until the Cretaceous, perhaps in association with the early radiation of flowering plants (Pirozynski, 1976b). The presence of laminar leaves as early as the Middle Devonian, however, indicates that there was a phyl-loplane microhabitat available for fungi much earlier. In addition, the discoveries of ascomycete-like fungi as early as the Silurian (Sherwood-Pike and Gray, 1985) provide evidence that this group may have evolved far earlier than we previously thought. Perhaps the early relatives of leaf-inhabiting fungi occupied other types of habitats. It is also possible that fungi became associated with leaf surfaces far earlier than the Cretaceous, but they have not been found. 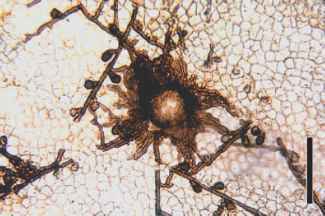 There is some evidence that the methods used to separate fossil leaf cuticles from the rock and prepare them for study may be destroying epiphyllous fungi. Another interesting approach that has been used to identify the presence of epiphyllous fungi in fossils is based on the analysis (gas chromatography-mass spectrometry) of lipid fractions extracted from uninfected and infected conifer twigs of Cretaceous age (Nguyen et al., 2000). This study suggests that it is possible to determine lignin degradation products in the fossils produced by the fungi even when the fungi themselves are not present.